How to Choose China Train Ticket Types? First class seats and second class seats on China trains are the first choice for a trip less than five hours, while sleepers are highly recommended for a long or overnight journey. Identified by the letters G/D/C plus several digits and usually in white or grey with bullet-like locomotives, the high speed types are fast, clean, well-equipped like an airplane and run more smoothly. They are the first choice of most passengers. But most of them do not run overnight and the price is generally higher than the normal type. Bullet trains are usually divided into 7 classes. Among them, second class has five seats in a row; first class has four seats, while VIP class and business class have three seats in a row. There are sleeper classes available on a few overnight D types: the soft sleeper class has four bunks in a compartment, while the deluxe soft sleeper has two bunks. Also, the new type sleepers with bunks arranged towards the train's moving direction. Second Class Seats have five seats in a row, three on one side of the aisle and two on the other side. The seats are like those in economy class on an airplane. The backrest can be adjusted to a comfortable angle and has a small, foldable table attached. The seats can be rotated so all passengers can sit facing forward. The seats in other classes also have this feature. Second Class ticket price is the lowest among all high speed classes, so it is the most popular and most frequently used. First Class Seats on C, D or G trains have four seats in a row, two on each side of the aisle. They are wider and softer than in second class. With a small pillow and a foldable footrest, they offer a more comfortable experience. The ticket fare is about 20% to 40% higher than second class. C, D or G train Business Class Seats are the equivalent of first class on an airplane and are only available on G and some D types. There are two sofa-like seats on one side and one on the other side. The seats can be adjusted flat for passengers to lie down. The fare is the highest- about twice that of first class. They are available on G and certain D types. They are as comfortable as those in the first class carriages, with two on one side and one on the other. The fare is higher than the first class and about twice of the second class. Besides the above seats, there are Soft Sleepers and Deluxe Soft Sleepers on a few overnight D trains. They can only be seen on some long-distance D trains running overnight. There are three types of them: soft sleepers in traditional style with two double-deck berths in a private cabin with a sliding lockable door; deluxe soft sleepers with two berths, an independent toilet and a lockable door; new style sleepers arranged in accordance with the train's running direction without door but a curtain for each berth. This is a kind of prepaid card used for taking some high speed trains. There are two kinds of them, one without discount applicable widely and one with discount only applicable to Beijing-Tianjin Inter-city High Speed Railway. Both have two types, golden pass for taking first class seat and silver pass for second class seat. Usually colored blue, red or green, they are identified by Z/T/K/L/Y/S plus digits or just several digits without letters. They run at a lower speed than high speed types, but they run day and night. The facilities are generally of a lower standard, e.g. the toilets are mostly squatting ones. With relatively lower prices, they are often the choice of budget travelers, especially overnight trains for the purpose of saving daytime and hotel expense. The hard or soft sleepers are great for overnight or long-time travel, while the hard or soft seats are acceptable for a short trip. Try to avoid traveling by a seat during peak seasons like the Chinese New Year and the National Day Holiday, for the seat carriages are overcrowded. A Hard Sleeper compartment usually comprises six berths arranged in three levels on the two sides. As the compartments lack doors, it is hard to have a good sleep due to continuous snores, kids’ crying, and the sound of the train moving. The fare is about twice as much as a hard seat. Like those on the high speed D type, a Soft Sleeper compartment consists of two upper and two lower berths. The berths are wider than the hard sleepers. More importantly, each compartment has a door. The fare is about 50% higher than the hard sleeper. There are two bunks on one side of the compartment, and a leisure area with a sofa and an independent western style toilet. The fare is about twice that of a soft sleeper. They are only available on some long-distance trips between major cities. Some overnight D trains also have luxuty soft sleepers. Hard Seat is the cheapest among all classes. As the name implies, it can be something of an ordeal, especially for a long journey. Not only are the seats hard, the seat backs are almost vertical and cannot be adjusted. The carriages are always noisy, smelly, and crowded with non-seat passengers, especially during peak seasons. There are five seats in a row, two on one side and three on the other side. A small table is set between every two opposite rows. Standing Room Tickets are issued only after all the above tickets are sold out. Passengers holding these tickets are only allowed in the hard seat carriages, standing along the aisle or at the end of a carriage. The fare is the same as that of a hard seat. 1. Children under 3.9 feet (1.2 meters) and accompanied by an adult can travel for free. They do not have their own seat or bunk but share one with the adult. However, if a seat is required, it can be purchased at half the full fare; whereas that of a hard/soft sleeper is the full price minus half of the hard/soft seat fare (about 75% of the full price). If there are two or more children under 3.9 feet in height, only one child enjoys a free ride and the others have to pay for child tickets. 2. Children between 3.9 feet and 4.9 feet (1.5 meters) have to pay. The fare for a seat is half of the full fare and the child has his/her own seat. If the child takes a hard/soft sleeper and shares a bunk with the adult, the fare is still half of the hard/soft seat. However, to have his/her own bunk, the fare will be the full fare of the hard/soft sleeper minus half the fare of the hard/soft seat (about 75% of the full price). These are only for Chinese college students. Foreign students cannot buy them. 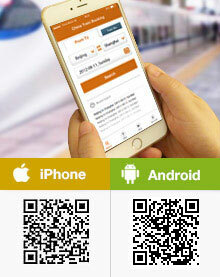 Platform tickets are for people seeing off or picking up friends and relatives and costs CNY 1 - 2. However, to reduce congestion and ensure safety, many stations have stopped selling platform tickets. Instead, a card will be issued only to those really in need. Note: The above introductions do not apply to international trains from/ to China. C 200 km/h (124 mph ) Run for short distances between two nearby cities. Z - Direct Express 160 km/h (99 mph) Run directly to destinations none stop or with a few stops at large stations. T - Express 140 km/h (87 mph) Limited stops at large stations. K - Fast 120 km/h (75 mph) More stops at middle and large stations. Stop frequently along the way. Stop at almost every station along the way. Destinations are popular tourism cities. S - Suburban 100 km/h (62 mph) Used for commuting between the city center and the suburban area in some cities. Available only in mountainous area of Jiayang Mining Region in Leshan, Sichuan. Everything on our trip was great - boarding was easier and picking up the tickets with the ticket sheet was amazing! There were many features of the room on our overnight train that were not working or did not go as expected though: tvs and personal lights did not turn on, we were never given a way to lock the door, and we were right next to a smoking area so all the smoke went into our room. Since we slept most of the trip, it was manageable, but I wish we had known about it in advance. As always easy, convenient and very reliable. Train rides with travel China guide are the most comfortable way of traveling. Thanks for assisting me throughout. It was wonderful experience travelling in the G train. All went smooth and well. Tq. I have used China Travel Services on many occasions and the recent service provided was excellent again. I want to thank and recommend China Travel for their great and professional service - buying and delivering our train tickets to 3 different destinations on this current trip - always dependable from the first contact to the last. Thanks to Sunny who helped me with patience and good humour always. Always a good time. No problems at all with collecting the tickets and finding my berth on the trian. Pleasant ,albeit long, trip. I first used your service through Google and your team was fabulous. I then encounter trouble because I could not access Google in china , my fault. As I had printed times before I traveled I had a back up .When I emailed your staff my problem with both times and Internet connection problems your service , changes and solutions we of a first class response and my train experience was fantastic. The train is Fabulous, fast clean on time with good fun. By deciding to travel 2nd class I actually spent most of the time in the dinning car more room and meet people nice and beer was close both day trips and 5 hrs. All your advice was spot on , my only problem was I lined up in a refund line but there was no English so about a 15 min delay. Everything was WONDERFUL! Easy, great, and helpful! Booking process was easy and I had no trouble in showing them my confirmation codes to get my paper tickets. Traveling via G- train was a xream for me as i had heard lot about cgina fast train and to be honest it was awesome.. i had good time... all things were cool... from booking to ticket collecting and the ground staff who helped me to guide the door ways and the train boogey in which i was to sit. In short i would say it is best way to travel within china. Questions & Answers on How to Choose China Train Ticket Types? We are a family of 3 traveling independently on April 2019, we would like to stop at Chengdu for the Pandas and after visit the Glass Walk, Hanging Bridge at I believe Zhangjiajie. Is the train a good option, safe, clean? Or better to fly? We are glad to receive your message. There is no direct train from Chengdu to Zhangjiajie. Therefore, we suggest you take a flight instead which will be more convenient for you. At present, the flight only availably on each Tue, Thur, Sat. You could check the flight info around Feb with us. May I know any senior citizen ticket for overseas chinese ? If so, how much is the fares ? There is no senior ticket type. You need to buy normal adult ticket. The luggage is not a problem. You can arrange them on the luggage rack above the seats. G14 will stop at Beijing South Station. From there, it would take around 60 to 80min by taxi and cost around CNY130. The time by metro lines would be almost the same. how does one get from the Train in Beijing to the international airport- and how much are the train tickets and to get to airport? the ticket price for the day time high speed ride is fixed, CNY553 per person for second class seat and CNY933 for first class seat. To Beijing airport, you can take the metro service (line 4+line 10+ Airport express line) or airport shuttle bus. The cost is CNY30 per person. We wish to travel the High Speed Bullet train from Shanghai to Hong Kong. Are the ticket prices for a single or a return ticket? The schedule is not posted yet and the ticket haven't begin for sale. The price will be for one way ticket.